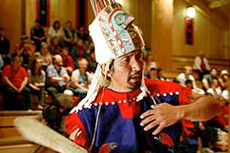 Participate in Icy Strait’s tribal dance show, a moving glimpse into the world of native Alaskan culture and tradition. We had an entertaining and interesting guide and, again, a gorgeous day. We had an entertaining and interesting guide and, again, a gorgeous day. Learning about the Tlingit culture and the little town of Hoonah was great. The dance was beautiful and a nice end to the tour. The dancers are middle school students and not the professional dancers. The dancers are middle school students and not the professional dancers. So it was not as enjoyable as I had expected. I had booked the Forest Tram with Tribal Show excursion, and I felt it was total bust. Hubby & Daughter liked it. Hubby & Daughter liked it. Put on by high school kids. I would have preferred to spend time elsewhere. Fun mixture of native storytelling, song, and dance. Loved Hoonah and the people. Loved Hoonah and the people. Wish we had longer to spend there. Little disappointed in the tribal dance. Little disappointed in the tribal dance. Would have preferred just the tour of Hoohnah and maybe spending some time in Hoonah. Being greeted by the tribal dancers on the dock was a very nice touch. Being greeted by the tribal dancers on the dock was a very nice touch. Their costumes were quite ornate and very beautiful! Really made us feel welcomed! We were really looking forward to this. Was very amateurish, however we did sit through it, unlike many others who walked out. My favorite port. Loved learning about Hoonah and tribe history. Th elocal folks were very informative and educational. Got a real taste of the cultural heritage of this town. Got a real taste of the cultural heritage of this town. The story teller and the dancers were great. Would highly recommend this excursion. Also enjoyed walking about here, as you were very close to the ocean, and lots to see. The dance demo was well done. The Tlingit (pronounced KLING GIT) reenactment theater and dance was enjoyable, and allowed visitors to participate on stage. The kids liked this performance. I left wanting to know more about the Tlingit people. Native story tellers & dancing made the show! The Tribal Dance Show was a moving glimpse into the world of native Alaskan culture and tradition. The Tribal Dance Show was a moving glimpse into the world of native Alaskan culture and tradition. I was honoured to be given the opportunity to adorn one of the native clan blankets while joining the dancers on stage.